It’s not true that nothing good can come of texting someone in the middle of the night. Faith had the initial idea for these Mediterranean mashed potatoes, and several texts with Chris Prosperi later, a recipe was born. The inspiration behind the recipe was simple: It’s Thanksgiving, and since turkey is such a neutral meat, Faith wanted to create a side dish that would add some interest to the plate. What’s more interesting than salty bits of crispy prosciutto in every bite? The toasted pine nuts—totally worth the splurge, by the way—give the potatoes Mediterranean flare. These potatoes are “loaded” in the best possible way. 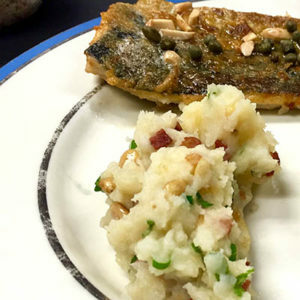 In one version of the recipe, capers were included. We like that idea if the potatoes are served with fish, but we decided to leave them out when making the dish for a holiday meal. ON-DEMAND: Listen to Faith and the gang talk about how this recipe came together. During recipe testing, Chris added a bit of cream, so The Food Schmooze team tried these with and without the cream. That cream, while not especially Mediterranean, gave the potatoes their wonderful texture. Wash potatoes well and place in a large pot. Cover with cold water and bring to a simmer. 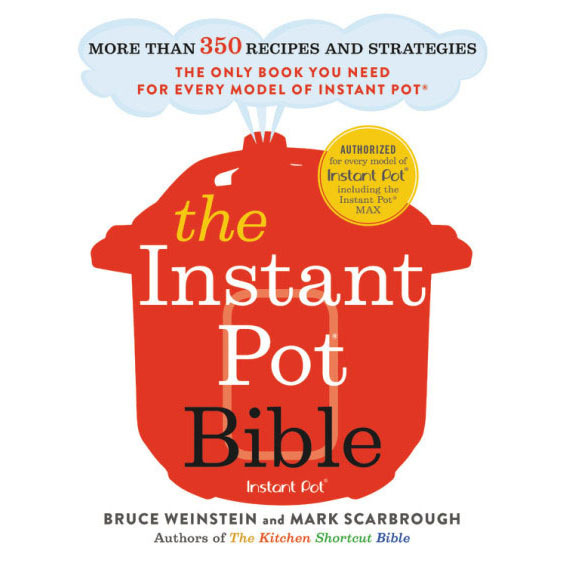 Simmer gently for 30-35 minutes or until potatoes are cooked. Strain into a large colander in the sink. Let sit and steam for 2 minutes. Transfer back to pot and mash with a large fork or potato masher. Season with sea salt and pepper. Next drizzle half the olive oil and the cream on to the potatoes and fold in. Repeat with the rest of the oil and mix well. Toss in the scallions, prosciutto, and pine nuts and mix well. Taste and adjust seasoning with salt and pepper. I can’t wait to make this. Could the 4 pounds of potatoes be split in half and used with cauliflower as well? Trying to lighten up some of the sides as much as possible in our butter filled home. If you’re asking to sub in half the amount of potatoes with cauliflower, of course you can do that. Lots of lightened mashed potato recipes out there suggest that very swap. I might steam the cauliflower separately from the potatoes, though, and add the potatoes and cauliflower together once they’re both cooked through. The cauliflower will cook faster than the potatoes. P.S. Love that you call it a “butter filled home.” We hear ya! Do you think this could be made one day ahead?